iOS 9 is here. The release represents months of development and testing, and is sure to catch the attention of consumers running compatible iPhone, iPad, and iPod touch devices all over the world. The temptation to immediately upgrade to experience the feature additions and improvements will likely be strong, but is there any reason why you shouldn’t update as soon as it’s launched? We think so. 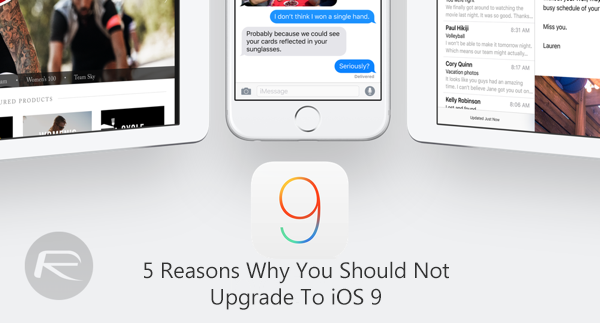 Check out these five, handpicked reasons discussing why you should not upgrade to iOS 9 today. Also read: 5 Reasons Why You Should Update To iOS 9. This one is a no-brainer for anyone with any kind of experience of jailbreaking. The latest publicly available untethered jailbreak is currently sitting at iOS 8.4. That probably means that the majority of jailbreak fans who can’t live without their tweaks and extensions have already foregone iOS 8.4.1 to keep their jailbreak. The availability of iOS 9 doesn’t change that, meaning that jailbreakers should definitely stay away from it until more information has been provided about the status of an untethered jailbreak option for iOS 9. 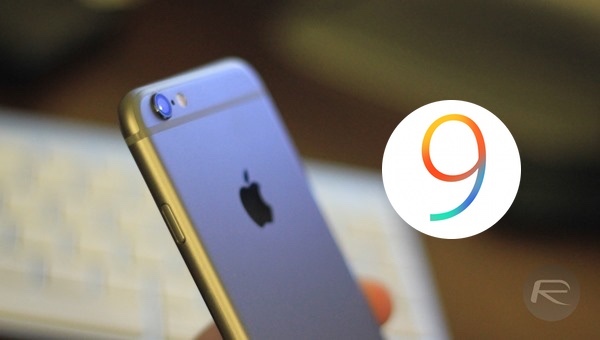 Developer iH8Sn0w has already proven that iOS 9 is vulnerable, and can be exploited. But there’s no knowing yet on whether he will ever release it or not. With that in mind, it’s likely that any teams working on a jailbreak, namely TaiG and Pangu, will focus their efforts on iOS 9.1, where the first public beta has already been released. For our up to date coverage on iOS 9 jailbreak status, check this page: iOS 9 Jailbreak Status Update For iPhone And iPad. This one is a bit of conundrum. Developers have had unlimited access to iOS 9 and all of the pre-release seeds of the firmware since it was initially unveiled during this year’s Worldwide Developer Conference in June. With that said, it doesn’t necessarily mean that said developers have taken the opportunity to provide compatibility updates for their apps, if one is needed. The jump from iOS 8 to iOS 9 is relatively minimal in terms of breakthrough changes, but the likelihood is that some popular apps will require updating or they will break. We’d like to think that most large development houses, who develop and maintain popular applications used on millions of devices across the world, will have already completed the necessary upgrades. If not, then it may be worthwhile stating away from iOS 9 for now. Updating an iOS device to the latest available firmware on release day can prove to be a rather frustrating experience. Consider the amount of iPhone, iPad, and iPod touch devices in use across the globe that are capable of running iOS 9. Then imagine a fairly large percentage of those devices all polling Apple’s authentication servers at the exact same time to download, install and verify iOS 9. Apple does a magnificent job of keeping things running as smoothly as possible, but still, problems can and do arise. There’s also the issue of downloading what could potentially be a fairly sizeable OS update over a potentially expensive data connection. If anything does go wrong you certainly don’t want to be left with a device stuck in recovery mode when traveling and away from home. History has already shown us that installing Apple’s latest firmware on older hardware can be problematic. Apple does its’ very best to ensure that as many devices as possible are capable of supporting the latest version of iOS, but that isn’t always a good thing though. As an example, installing the very first public build of iOS 8 on an iPhone 4 or iPhone 4s caused serious performance issues for a lot of users; reportedly to the point where their device become pretty much unusable. Apple has concentrated on improving the fluidity, performance and installation sizes of iOS 9, which should definitely assist with older hardware. However, the possibility exists that upgrading to iOS 9 could seriously damage the performance of Apple’s older hardware. iOS 9 has been seeded to developers and testers at regular intervals over the last three months. It’s also been tested internally during that period by Apple engineers and approved beta-testers. You’d like to think that iOS 9 would hit the devices of users around the world offering a trouble-free, bug-free experience, unfortunately, this is large-scale mobile operating system development. Bugs are always going to exist, especially in the very first version to hit the public. It’s unlikely that there will be anything huge or show-stopping released as part of iOS 9, but if you know in your own mind that the potential existence of bugs will cause you issues, then it’s probably best to give iOS 9 a wide berth until iOS 9.1 is officially unveiled to the public. Can’t live without my tweaks. No updating for me! Your do not disturb tweak intrigues me. What is the name of it, and which source is it from? Me too! What is it? can’t you just schedule it from the dnd pane in settings? lol… speaking of dnd tweaks, check out isol8. if you’re in a lot of group chats, it works wonders. DO NOT UPGRADE if you don’t want to be forced to use the new iCloud Drive to sync your documents and data! If you have an iPhone 4 and iPad 2 or newer devices for instance, you may have the old iCloud account, by upgrading to iOS 9 on your iPad you will be forced to use the new iCloud Drive, which will mean your iWork documents will not sync to your iPhone 4. It also means if you don’t upgrade to iCloud Drive, you will “lose” (don’t worry they always stay in the cloud) your documents or remain hidden shall we say, as they will not sync to the iWork apps until you do. So sad they force this upon us without warning. Guess it could be worse.